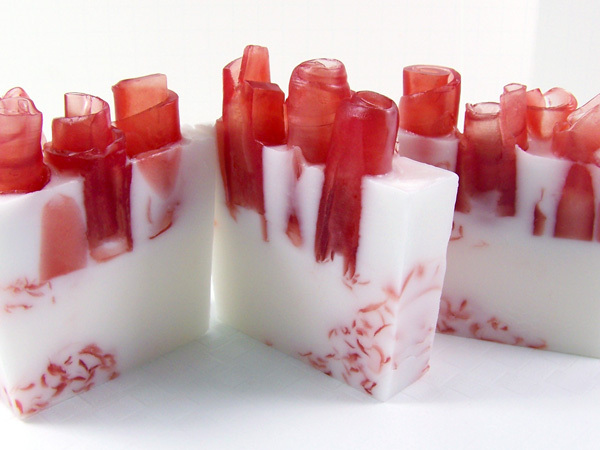 A bed of roses in soap form! 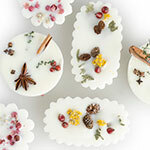 You can customize the colors and fragrances for any flower you like. Make a full bouquet! 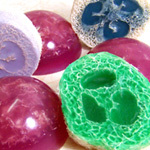 This is an advanced soap tutorial highlighting soap embed placement. 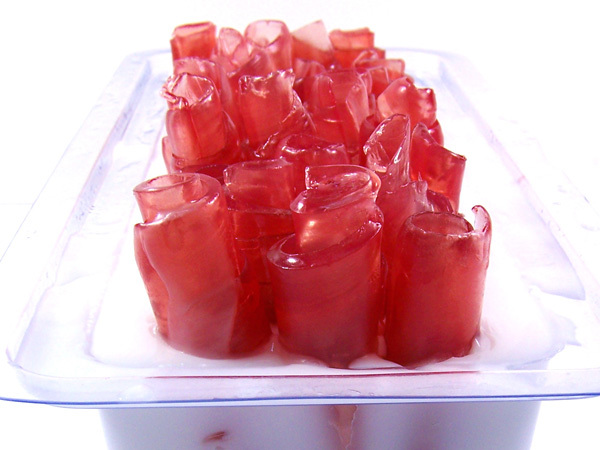 Step 1: Cut up 32 ounces of Ultra Clear Melt & Pour soap base into small cubes using a sharp knife. 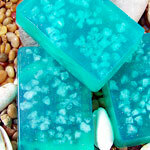 Using a microwave safe container, melt the soap base cubes for 30 seconds. Repeat if necessary but be careful that you don’t burn or boil the soap. 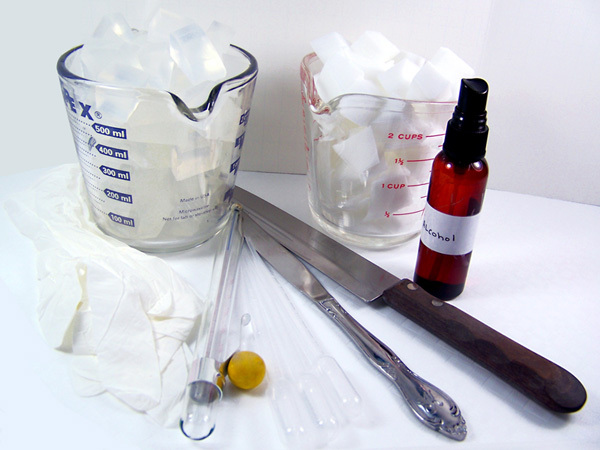 Step 2: Using a 0.15cc scoop add 6 scoops of Bordeaux mica, and with a disposable pipette add 10 ml of soap scent. 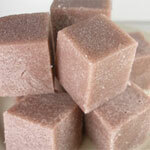 For this tutorial we’re using Pink Lilac and Willow fragrance oil. 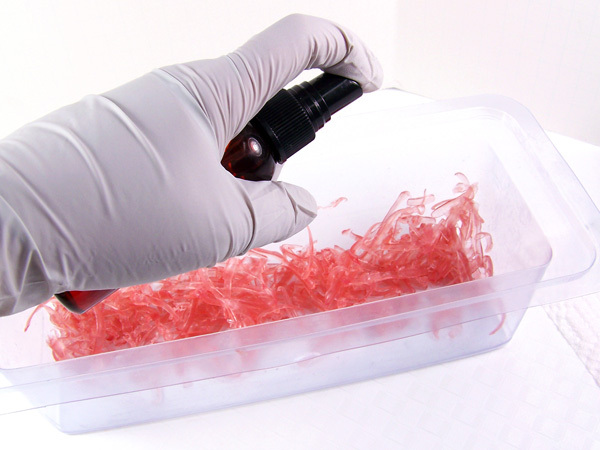 Stir carefully to incorporate thoroughly. 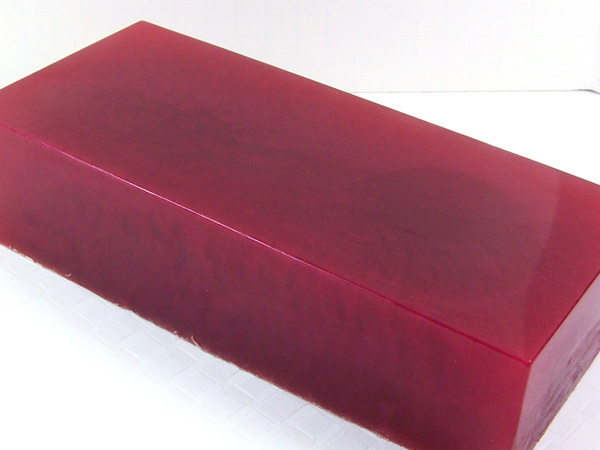 Step 3: Monitoring the temperature, pour into the square loaf soap mold when the soap reaches about 135°F to 140°F (to avoid warping the mold). Let set overnight until completely hardened then remove from mold. 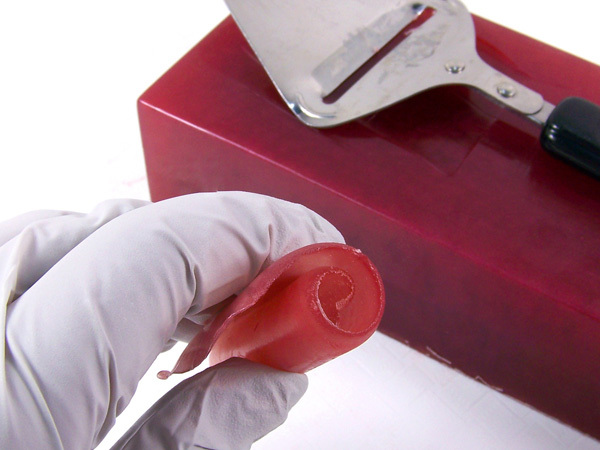 Step 4: To create the “rose” curl embeds, peel long strips of soap from this block using a vegetable peeler or cheese slicer. 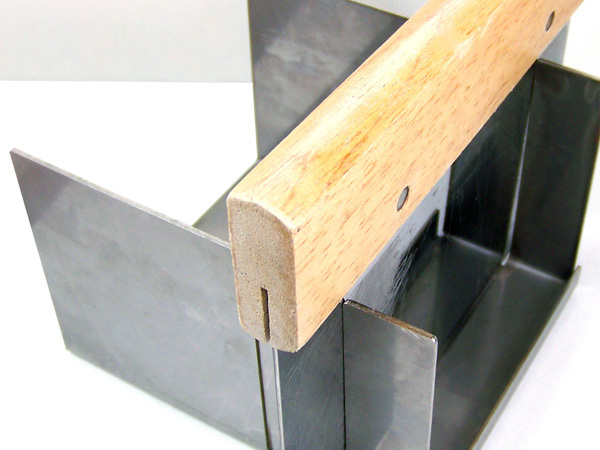 Don’t make the strips too thick; you want the strips to curl. 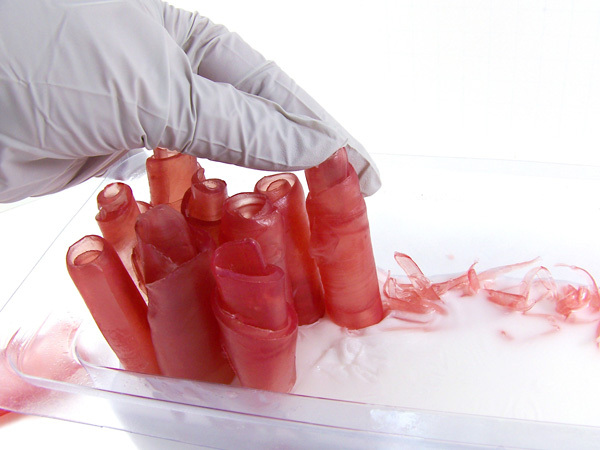 Step 5: With your fingers, take the soap curl and form it into a spiral. 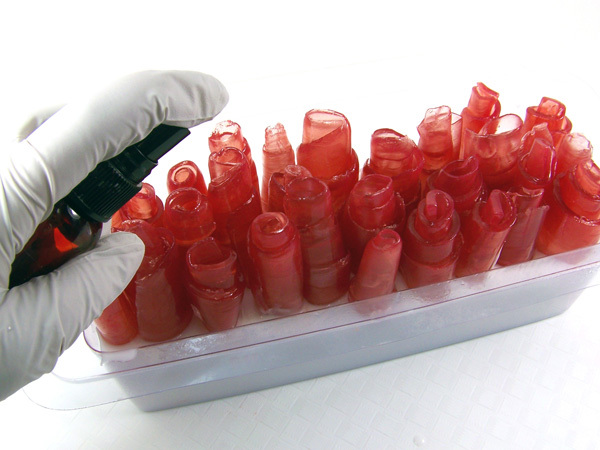 You want them long enough to have half the spiral stick in the mold and half to stick up out of the mold. Roughly 2.5 – 3 inches. Make enough curls to fill the loaf mold and set aside. 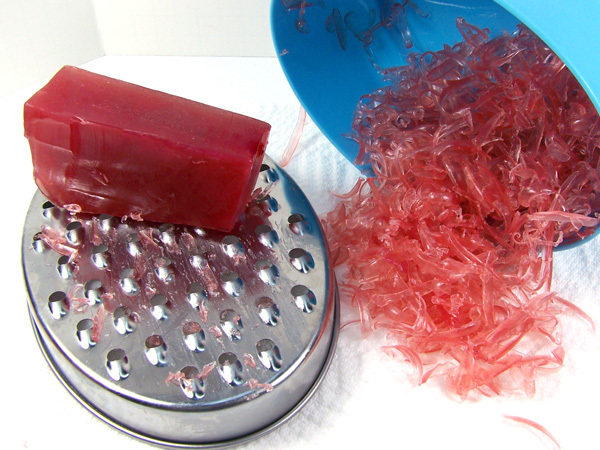 Step 6: Using the grater, grate about 1 cup of the clear red soap block and set aside. 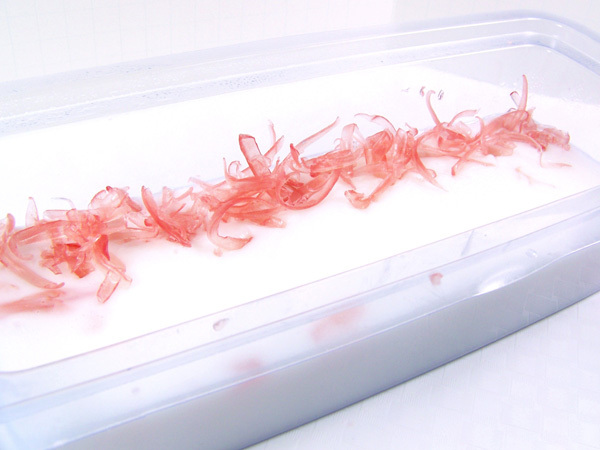 Step 1: To give the appearance of “falling petals” let’s utilize grated soap. 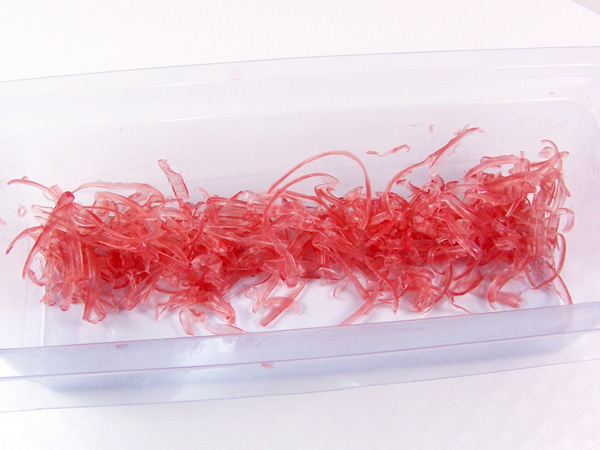 Take the grated soap and place along one edge of the loaf mold. 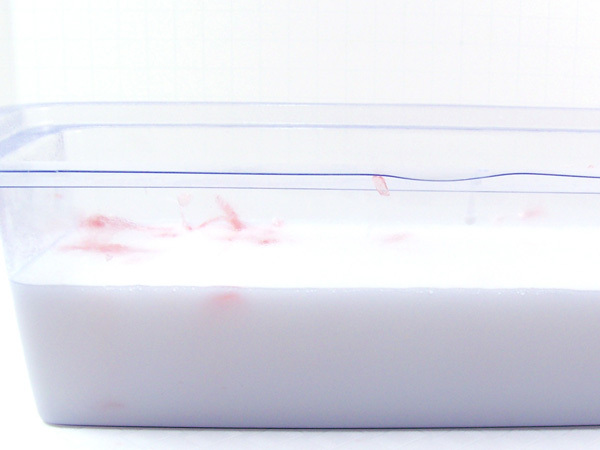 Step 2: Add 35 ounces of cubed White Melt and Pour soap base into a microwave safe container and melt the soap base in a microwave for 30 seconds. Stir then repeat until melted. Step 3: This will be left white. 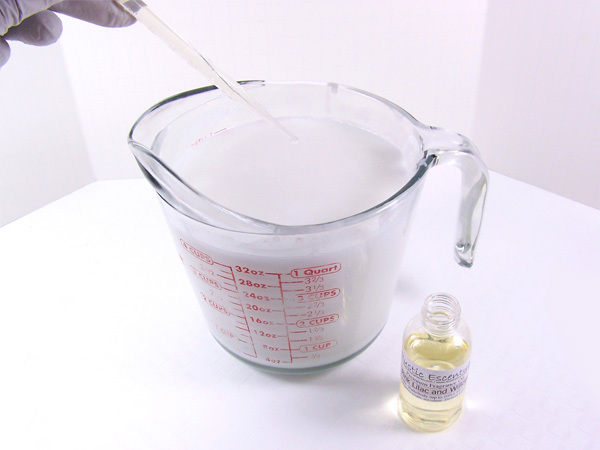 Add 15 ml of Pink Lilac and Willow Fragrance Oil and stir slowly. Monitor the temperature until it reaches about 135°F to 140°F. 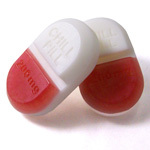 This will prevent the embeds from melting. 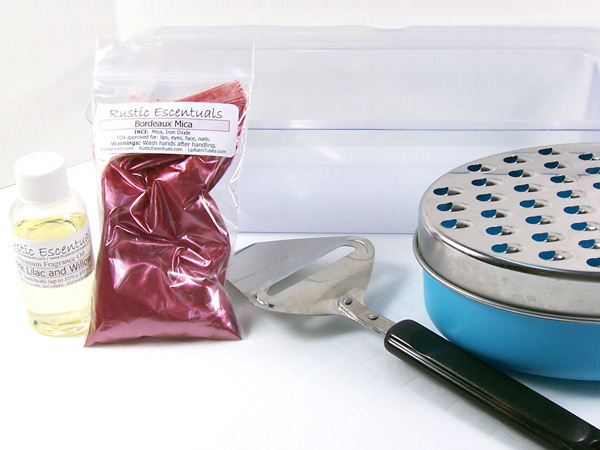 Step 4: Spritz the grated embeds with alcohol and slowly pour the white scented soap into the loaf mold. 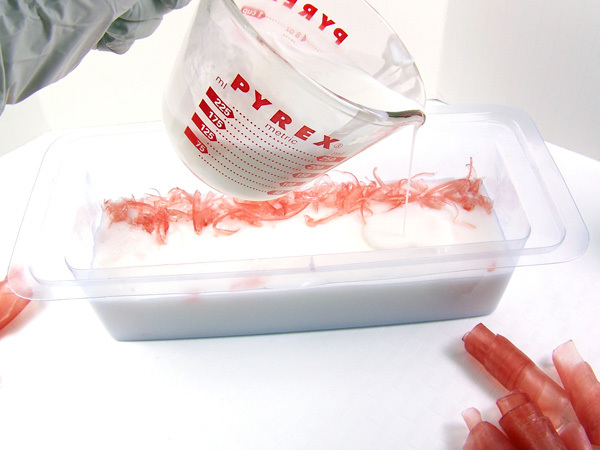 Pour slowly along the center of the mold – this will help the grated soap to gently drift out of the corner. Step 5: Pour a little more than halfway up the mold and spritz with alcohol to remove any bubbles. Step 6: Sprinkle some more grated soap onto the melted white soap along the edge of the mold and let set until this layer is hardened sufficiently to take the 2nd pour. You don’t want it to dip in when positioning the rose curls. Step 7: Spritz the first layer liberally with alcohol (don’t forget the edges). This will help the layers adhere to each other. 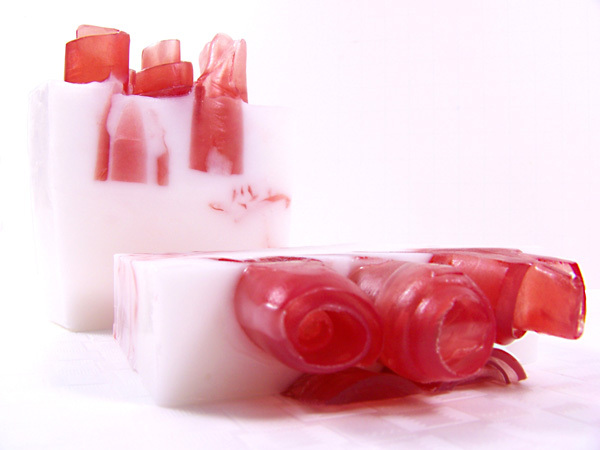 Slowly pour about 1 ounce of white soap, a quick spritz of alcohol to get rid of any bubbles, and start positioning the rose curls down the center of the mold. This small layer will thicken and harden quickly. Once it does the embeds will be “glued” in, so work fast. 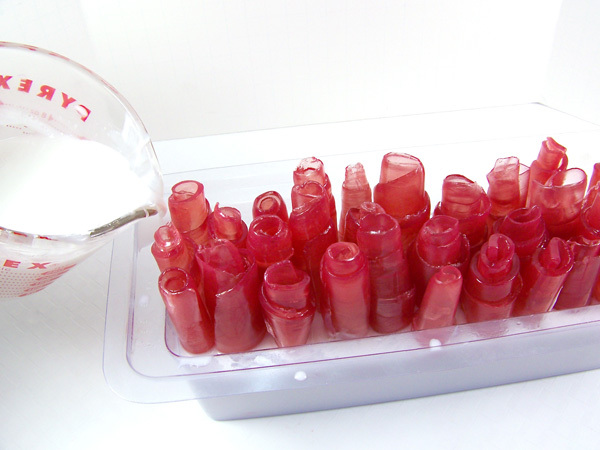 You can add these curls in small batches, repeating this step until they are all positioned in the mold. 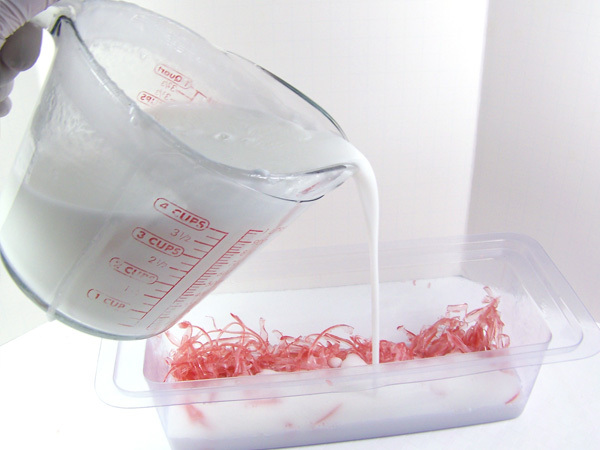 TIP: Transfer the remaining white soap into a smaller measuring cup to have better control of pouring. 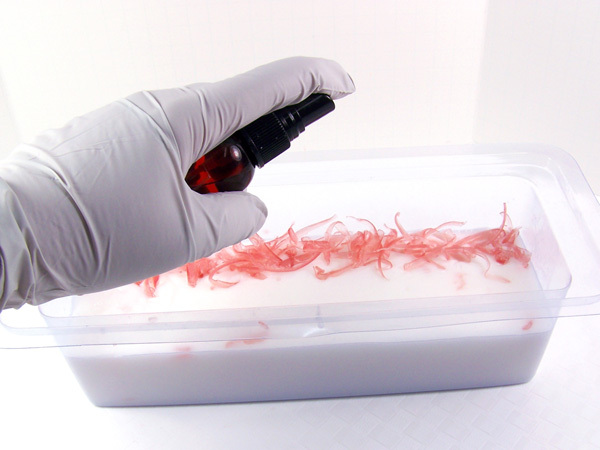 You want to avoid pouring white soap onto the soap curls. Step 8: When all of the curls are in place and the last layer is hardened, spritz everything again liberally with alcohol and pour the rest of the melted white soap all the way to the top of the mold. 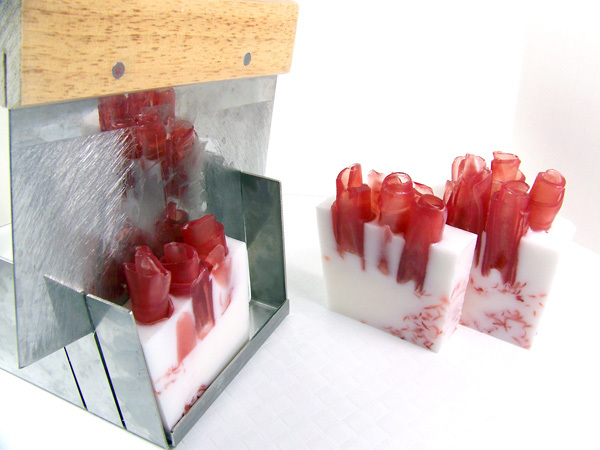 Pour in the corners of the mold to avoid pouring the white soap over the red soap curls. Step 9: Give everything a final spritz of alcohol and let set. This is a large amount of soap so let it set and harden overnight. 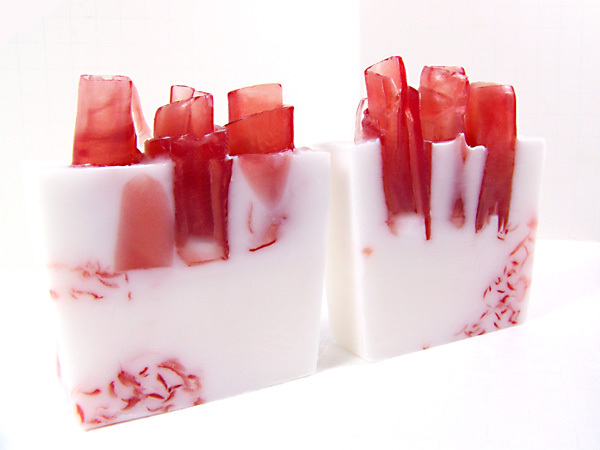 The next day, slowly pull the sides away from the soap, turn over and while holding it with one hand, slowly press on the underside of mold to release the soap. 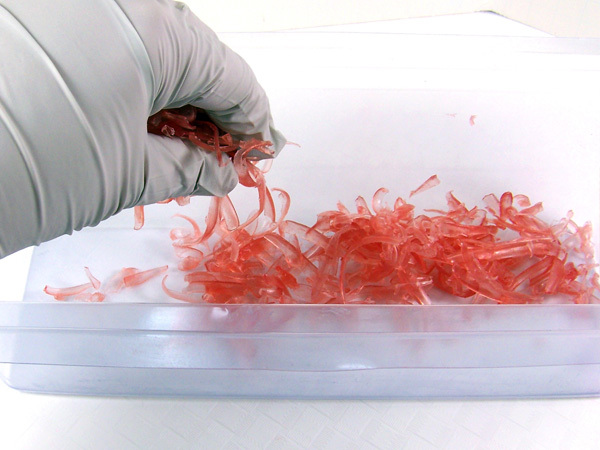 Don’t lay it down while removing from the mold or the rose curls will bend and break. 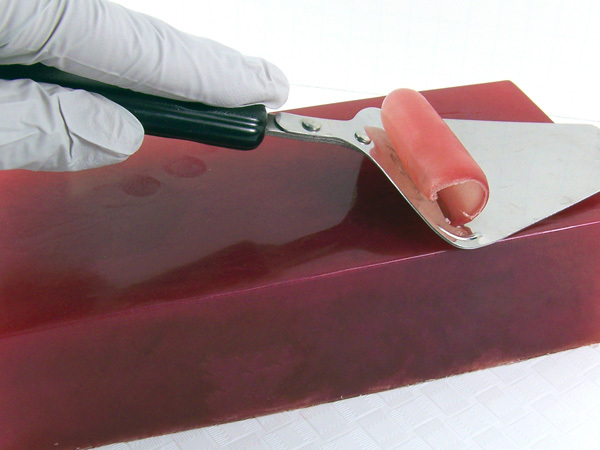 Cutting the loaf with a soap miter box in 1-inch increments will yield approximately 9 bars of soap.